It’s time to expose the big FAT F-Word in the middle of your life! Is FINE crowding out fabulous in your life? That’s right, you’re fearful. Living in fear. F.E.A.R. is what I like to call: Forgetting Everything And Running. But F.E.A.R. redefined is when you: Fully Engage And Remember. That’s the key. Remember who you really are. Turning your SCARED into SACRED. This is where you wall yourself off from others. It’s like you’re saying “Leave me alone.” As you disconnect and lick your wounds. It’s the ultimate disengagement that leads to a divorced heart. Connecting so your can go from DISENGAGED TO ENGAGED. Fully engaged in your life. No longer FINE, but instead, FULFILLED. When you medicate, suppress, repress, or do whatever it takes to keep from feeling. Allowing yourself to FEEL in order to HEAL. It’s an Emmy-Award Winning performance of pretending. When you stop PRETENDING, and begin TENDING TO YOUR HEART AND SOUL. Full engagement in what’s REAL in your life. It’s time to come out of your cage…your box…and begin to live your fulfilled life. Fully engaged. As you write, allow yourself to see the TRUTH. then, make a declaration that you’re going to begin to redefine FINE in your life. I’m going to be inviting listeners onto the program. If you have a story you’d like to share — a song to sing (but not a Poor Me Story) — send me an email at: drshannon@doctorshannon.com and put SHARE MY STORY in the subject line. I can’t wait to meet you there, and engage with you even more! Thank you for being here, and allowing me to sip on life with you. To listen to the song I wrote, you can do so here: letsnottalkaboutex.com, and also cast your vote on your favorite version. If you’ve been feeling like you’re stuck, overwhelmed, or perhaps you still feel like you’re drowning, please don’t hesitate to reach out. 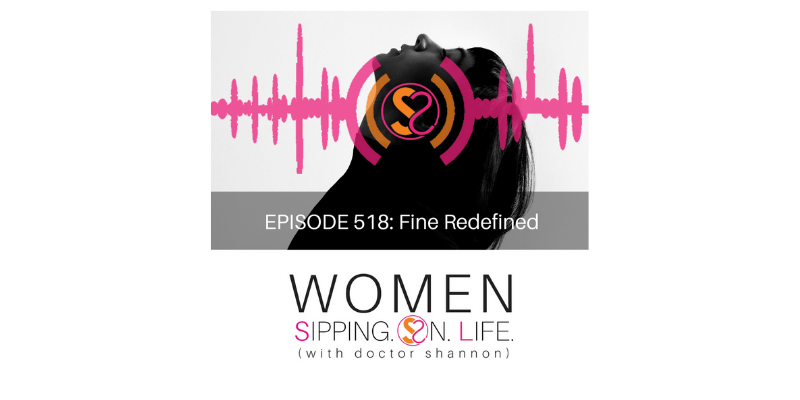 Visit WomenSippingOnLife.com for more free resources, including my CHECKLIST FOR CHANGE, Engagement Checklist + Evaluation Rating, Six Sacred S.O.L. DATE Secrets…and a FREE copy of my best-selling book, Date Yourself Well. You can also check out my Dr. Shannon Facebook Page for more daily S.O.L. TRAINING. I look forward to seeing you again tomorrow. Please invite your best girlfriends to come and join our S.O.L. PARTY. xo Dr. Shannon. Inspiring minds that want to grow and hearts that want to know, so you can love you, your life, and your life’s work well. ONE SIP AT A TIME.